Home › Latest News › These Boots Weren't Made For Walking! Riding boots provide a lot more features than one would think. At first glance, a riding boot looks clunky, hard on the foot and uncomfortable but remember, that’s just looking at the boot. Looking and getting a feel for the piece of desired footwear are two completely different ball games. 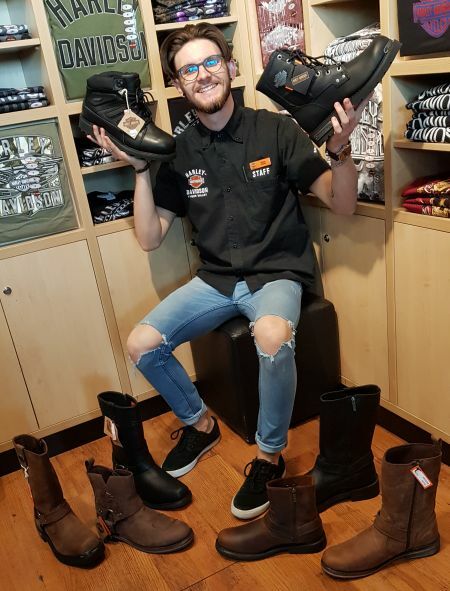 Here at H-D® Tyger Valley we encourage you, the rider, to actually fit the boot on and climb onto your motorcycle or future motorcycle to get a feel for them. Think of it this way, our boots are not just made for walking. Each and every style has either a unique or shared feature. Let’s refer to lengthier boots first; great for the colder weather as it retains heat and offers protection towards a higher area of the leg as opposed to the shorter styles. Lengthier boots are the boot of choice for long distance touring. Shorter boots have a great look to them but offer just a tad more protection around the ankle. Sounds odd right? Well, here’s the reasoning behind it- Depending on style (laced or not laced) the ankle area will feel a lot more secure with a laced boot. Ever wondered why basketball players always have such high sneakers? It’s to protect the ankle from rolling in an unnatural direction. The same principal is applied to a short, laced boot. Laces are most definitely a nuisance, that’s why most of the styles also incorporate a zip to allow easier access for the foot. Lengthier boots will most likely always feature a zip, no one wants to be tying up a 35cm boot! The Harley-Davidson® Boots have a nifty little feature when it comes to the zips of our footwear. Our boots will feature a water-resistant zipper lining, meaning that it’ll block out most moisture trying to enter from the outside – such as rain or perhaps wet roads. Riding in wet weather is nobody’s first choice, but best to have the Harley® Boots on! Our Harley® boots also feature an anti-oil slip lining on the sole. This is usually the unique orange design on the sole of the boot. An easy way to spot which is a riding boot and which isn’t, is by having a look at the sole – a thicker rubber sole is for riding and a thinner, smooth sole is for non-riding. Afraid of damaging your leather Harley® boots when in wet weather? We have a solution for that too! They are called Harley-Davidson® Rain Gaitors. Rain gaitors are the next best thing to keeping your feet dry in wet weather. They slip onto your feet and surround your boots just as a rain jacket would do.